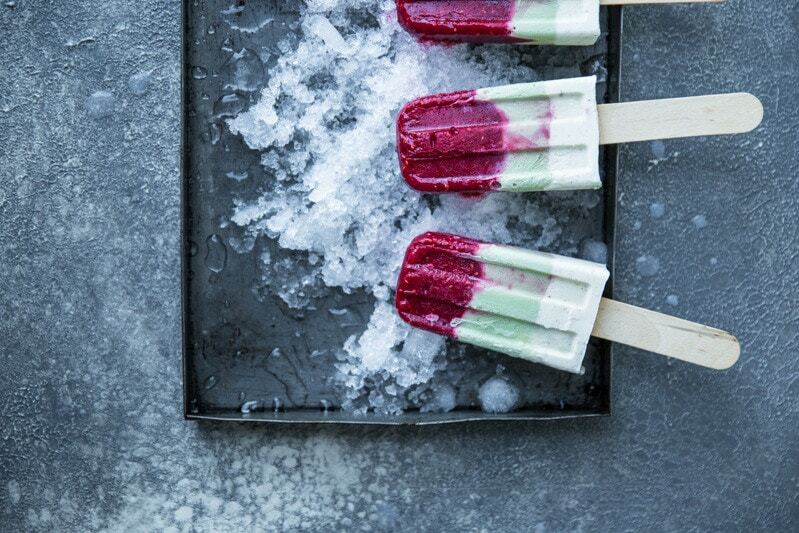 How fun are these tri-coloured, vibrant fruit and cream popsicles? 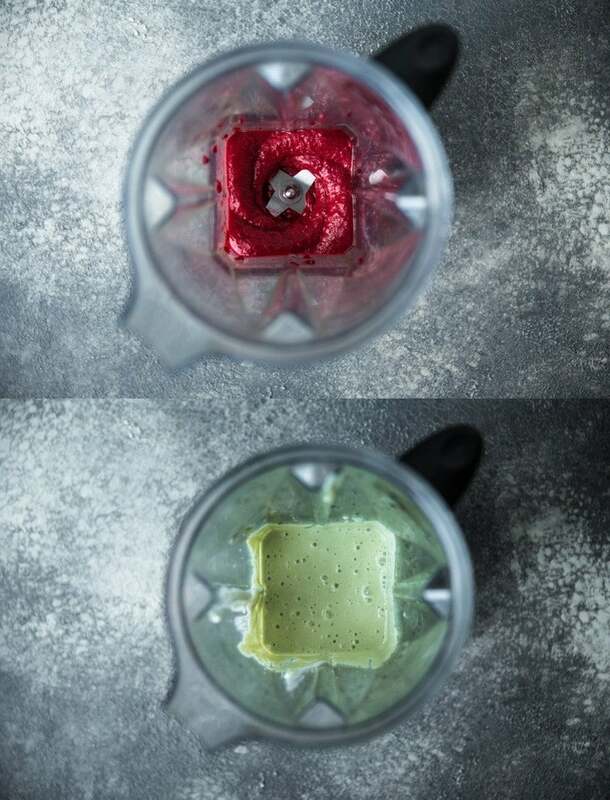 Raspberry, Matcha, Lime & Cream. Each layer is a revelation of flavour that come together in an explosion of mouthwatering delight. I love fun popsicles. Especially layered ones. The fancier the flavour, the more likely I am to make a beeline for those at the local markets. Although I always thought that making them would be fiddly. So I have stuck to making single flavoured popsicles that are truly a breeze to make. But also kind of boring. Now yesterday, my kitchen counter was clean. I mean spotless and empty (for nearly half an hour) clean! I get all kinds of giddy and excited about trying out a new recipe when that happens. Because it is a rare event. So, my kitchen counter was clean and I felt brave enough to tackle layered popsicles. I mixed and blended and tasted and wrote down the measurements as I went. This is my normal recipe creation workflow. At the end of 20 minutes, I knew I had a recipe worthy enough to share with you guys. The trick to make this entire process non-fiddly is to have a small section of your counter clean and empty and your sink empty. Then you need a small jug for pouring and a blender. You basically blend each layer of ingredients, pour and freeze. And between each set of ingredients, all you need to do is give your blender a quick rinse. Easy. If that doesn’t convince you to make these, I don’t know what will. 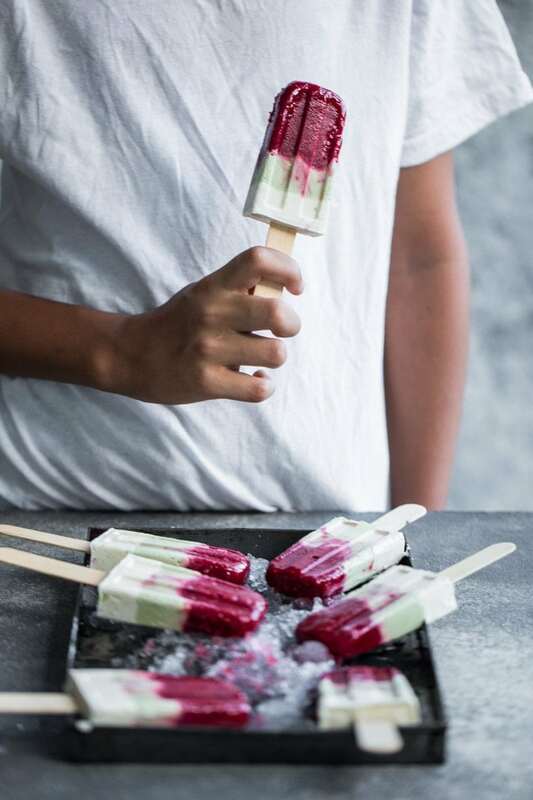 The colours are amazingly vibrant in this popsicle and the green comes from a cheeky addition of matcha. I am known to sneak in matcha everywhere! Also did you notice the hand model? Rivvy (my firstborn) who is just a year older than my blog, is I am pleased to announce – taller than me! Just slightly. It is very bittersweet for me to remember the times he first started toddling and mixing cakes for my blog posts, sitting on the kitchen counter in his diapers. To this gangly, handsome boy who wears his tee back to front without me asking (because the front has the Star Wars logo and we don’t do branding on the blog as he very well knows) and stands patiently albeit very unsteadily as I get some blurry shots of his constantly moving hands. He gets itchy feet when I shoot him, he informs me. It still gives me joy. And I think he enjoys it too. And before I go, many of you always ask about the popsicle moulds, I bought them on Amazon. Place ingredients for the raspberry layer in the jug of blender and process until smooth. Divide mixture equally between 10 popsicle moulds. Place moulds in the freezer for 20 minutes. Rinse your blender thoroughly. Add the ingredients for the lime layer to the jug of the blender. Process until smooth. 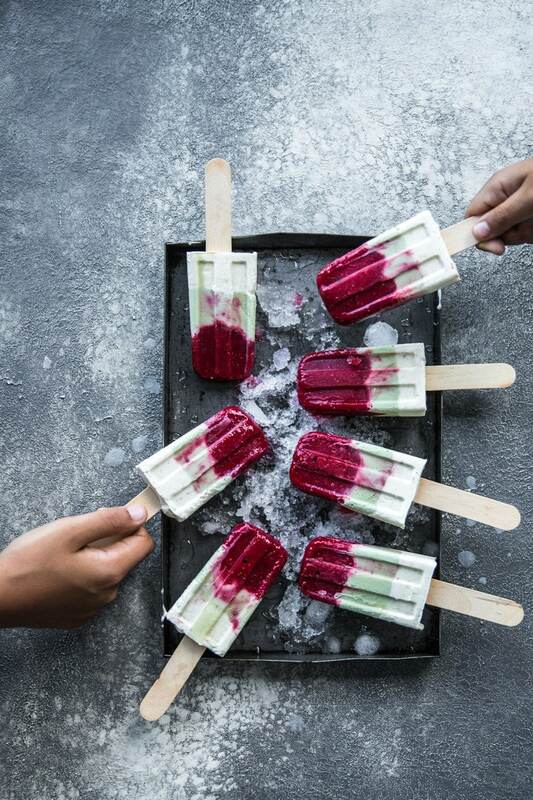 Remove the popsicle moulds from the freezer and layer the yoghurt mixture gently over the raspberry layer in all of the moulds. Return moulds to the freezer for 30 minutes. Place ingredients for the cream layer in a small jug and whisk using a balloon whisk until smooth. Remove popsicle moulds from the freezer. Carefully insert popsicle sticks in each of the popsicle moulds through the semi frozen layers. Pour the cream mixture equally into all the moulds, taking care to not displace the popsicle sticks. Return popsicle moulds to the freezer for another hour. At this point the popsicles will be quite frozen. Remove the moulds from the freezer one last time to cover the top of the moulds (the part with the stick) loosely with cling wrap or an eco Honeybee wrap. Return to the freezer for at least 4 hours or freeze overnight. 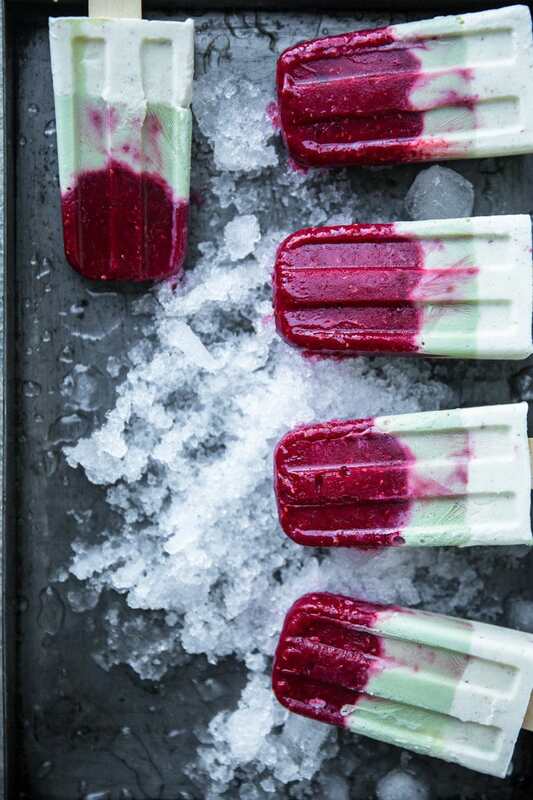 When ready to serve, remove the popsicle moulds from the freezer and allow to thaw at room temperature for 5 minutes. Gently and firmly grip the popsicle sticks and dislodge the popsicles from the mould. These look so gorgeous – the layers are amazing. I want the weather to get warmer so I can eat these! Oh wow, this looks and sounds amazing! 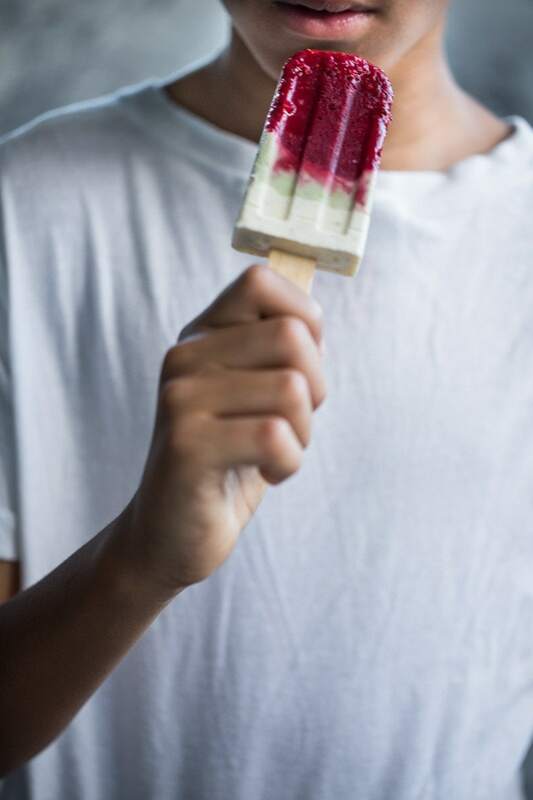 These popsicles (and your photos) are STUNNING, Sneh. I agree with the above comments . I can’t wait until the weather warms up I def will be making and eating theses and the photos are simply amazing . Thank you so much! Love it. Can totally relate to your comment about clean kitchen counters and getting excited to try something new!